The increased focus on reducing capital budgets by the mining sector is not necessarily going to pay in the long term. 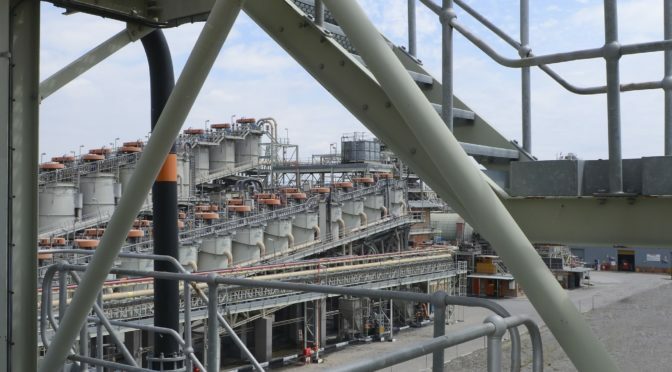 This is according to Mark Baller, managing director of Weba Chute Systems, who says that miners would do well to assess the operating cost of an item before making ill-informed decisions. “The focus should be on the payback period of a capital item and not only on the actual cost of the purchase,” he says. Baller says this is particularly true when it comes to transfer points, however he is also quick to point out that in many instances the cost of operating chute systems within a plant is largely unknown by the end-user. Activities that should be allocated to chute maintenance or repair are often hidden in other cost items. As an example, Ballers says that where excessive spillage occurs these clean-ups could be allocated to conveyor system costs purely because the reporting and allocating system does not allow for the transfer points as a separate item. “This lack of base knowledge is a major stumbling block to reducing operating costs on a plant. When the existing costs of operating chute systems is unknown you cannot measure anything against this. It is therefore difficult to motivate or justify the capital expenditure for an engineered transfer point solution and we often find that cheaper fabricated chutes are procured,” he says. Unfortunately, not selecting a correctly engineered transfer point often only becomes apparent much later down the line when the inherent problems with the cheaper option start causing major unscheduled downtime. It is at this stage, Baller says, that plant operators start to consider the real impact of the original purchasing decision. Weba Chute Systems believes that to bring total operational costs down plant operators need to adjust how they view operational and maintenance budgets. “We are encouraging plant operators to allocate costs associated with transfer points and chute systems correctly as only once this has been done will accurate costs be available for these items,” Baller says. “Without this information there are a lot of unknowns and plants tend to operate under the misconception that cheaper is better when it comes to transfer points. It is critical to understand the value that individual transfer points bring to the overall plant and this perspective with accurate operational data will enable end-users to make well informed decisions, from which benefits will be reaped in the long term. While multi-slope screens – also known as ‘banana’ screens – are commonly used in various screening applications, they need to be carefully designed with the specific purpose in mind, according to Kwatani CEO Kim Schoepflin. “Multi-slope screens have been in use since the 1970s and have a significant reference base, becoming very fashionable mainly because of the benefit they offered in terms of higher velocity leading to higher capacity ,” says Schoepflin. At the top of these screens is usually a first slope with a deck angle of at least 35 degrees – allowing material velocities of over 3 metres per second – curving down to end at about 10 degrees. This original layout, however, is not always ideal for many operations today. Failure to adapt the design appropriately to the application can lead to a number of challenges, says Kwatani COO Kenny Mayhew-Ridgers. “Material velocity is exponentially linked to the wear rate of the panels, and this high panel wear will lead to frequent and costly maintenance,” says Mayhew-Ridgers. Another design strategy to reduce panel wear is to create a more continuous curvature profile along the screen, with a higher number of slopes making for a gradual change of direction for material. This is based on the simple principle that the greater the change of direction, the more the panel will wear. Schoepflin highlights that, in dense media processes, it is also important to recover as much of the medium – such as magnetite – as possible, which the steep slope may not allow. To maximise recovery of the dense medium, the slope and material velocity may need to be reduced. A cost aspect that needs to be considered is that the physical height of a banana screen layout can also add to the screen infrastructure, as this structure also needs to be heightened. In addition, this height can make the screen more difficult to access for maintenance purposes. All these factors need to be considered by a user when deciding upon whether a multi-slope screen is optimal and – if it is – exactly how the design needs to be fine-tuned. As South Africa’s consumers today demand faster and more reliable connectivity for a range of home and home-office uses, Raubex Infra is working with telecommunications operators to roll out the ‘last-mile’ optical fibre cabling to the household. 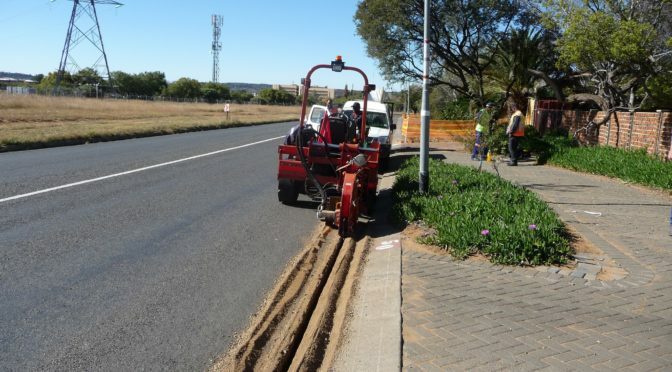 In a recent contract, Raubex Infra’s telecommunications division – which provides a diversity of network infrastructure solutions – provided fibre links to 2,200 homes in the Universitas and Waverley neighbourhoods of Bloemfontein in the Free State province. According to Danie Marias, operations director of the company’s telecommunications division, the project required the deployment of specialised equipment as well as the careful management of teams of trained workers for the manual aspects of the job. He highlights the importance of working neatly, quietly and quickly in the suburban environment, creating as little disruption as possible to the residents. The well-coordinated effort using a specialised trenching machine created a narrow slot some 20 to 30 cm deep in the roadway, into which the ducting was laid from a large reel. While this task could be best conducted using mechanised means, the shallow gulley for ducting to run from the road to the householder’s fence had to be manually dug. A termination box was then located at the edge of each property for later connection to network. Marais emphasises the importance of restoring the roadway to its previous condition of strength to avoid any ingress of water through weak points in the asphalt as this could reduce the lifespan of the road. The gravel removed by the trencher is therefore meticulously swept up and transported to a nearby site, where it is sieved and mixed with cement by a dedicated mixer to create a soilcrete mixture. Once moistened, the soilcrete can be packed into the roadway slot on top of the ducting, and then compacted to the required density ensuring the road layers are returned to their previous strength. The filled slot is then sealed with bitumen paint before a final asphalt layer is applied and compacted with a pedestrian plate compactor. In addition to conventional trenching operations, this division of Raubex Infra also conducts large-scale trenchless ‘direct lay’ projects over hundreds of kilometres, installing ducting for national fibre backbones using specialised heavy machinery. It also has extensive experience in horizontal drilling for the installation of underground cables, conduits and pipes. 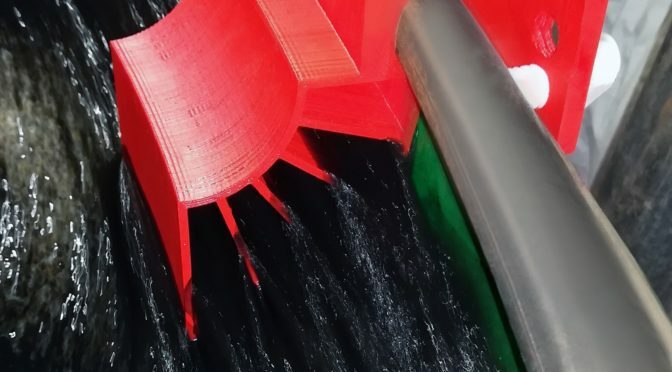 According to Integrated Pump Rental managing director Lee Vine, it is not uncommon for factors like high rainfall or an unexpected process fault to cause overfilling of a process dam with silt. 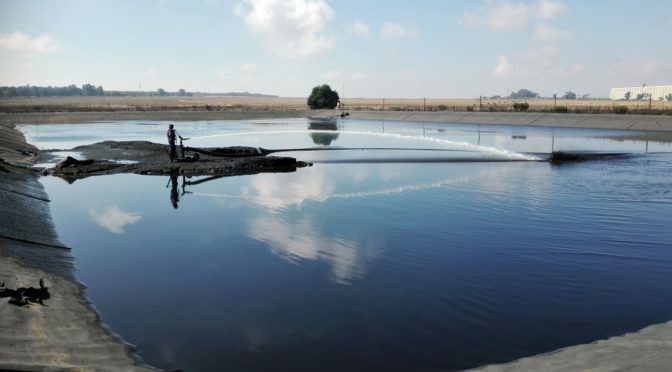 In a recent case, a mining customer urgently needed a process dam that had become filled with coal fines to be emptied. The situation raised the risk of an environmental incident which could have potentially interrupted the smooth operation of the coal processing plant. “One of the specific issues with coal fines is that they settle very quickly and create a highly compact layer at the bottom of a pond. In this case, the coal fines could be blasted into an accumulation point where a slurry pump was then used to transfer high tonnages of the sediment to a location specified by the customer. Integrated Pump Rental also provided the pipelines and fittings that the solution required. Reducing energy consumption is a reality for all industries in South Africa, and the WEG W22 IE3 premium efficiency electric motor can rightfully claim to be the most efficient motor that is turning industry in the country. Available from Zest WEG Group, the WEG W22 IE3 is available in models with a rated capacity up to 1,000 kW and has been engineered specifically to reduce energy consumption optimising on total cost of ownership in numerous applications. The WEG W22 IE3 product line was engineered using the latest generation computational tools such as structural (finite element method) and fluid flow analysis as well as electric design optimisation software. This resulted in a robust product that offers reduced energy consumption and thermal efficiency as well as a reduction in noise and vibration levels. Fanie Steyn, manager responsible for rotating machines at Zest WEG Group, says that because a chain is only as strong as its weakest link, during design close attention was paid not only to the internal efficiencies of the working motor, but also to the elements constituting the external components of the designed motor. The frame is a fundamental component in the design because, besides constituting the mechanical structure reference, it is the main conduit responsible for the heat dissipation generated inside the electric motor. “In addition, the frame and the end shields ensure the enclosure of the electric components, protecting them against the environment where the motor is installed,” Steyn says. “The frame design ensures high thermal exchange and high reliability where mechanical strength is essential.” The terminal box is located at the front of the frame thereby increasing the heat dissipation area and providing a uniform air flow over the motor frame. Reliability of the frame was also deemed important, so careful consideration of construction materials led to the selection of FC-200 cast iron which is produced in WEG’s own facilities. Interestingly, this is the same material that is used in WEG’s explosion-proof motors. The main function of the fan, when assembled directly on the motor shaft, is to promote the air flow over the frame fins, thus dissipating the heat generated inside the motor. The function of the fan cover is to protect the fan against external agents and to ensure continuous air flow over the motor fins regardless of the environmental conditions within which the motor is operating. As a natural consequence, when the cooling system is operating to promote heat dissipation, it generates acoustic noise and mechanical losses which can be caused by a combination of the friction of the fan blades through the air and ineffectual design of the fan cover’s shape. Good ventilation is key to reducing the mechanical losses, particularly for two-pole motors. Due to its high efficiency, an IE3 motor has inherently less demand for heating removal, so the ventilating system can be optimised to reduce mechanical losses and consequently acoustic noise. 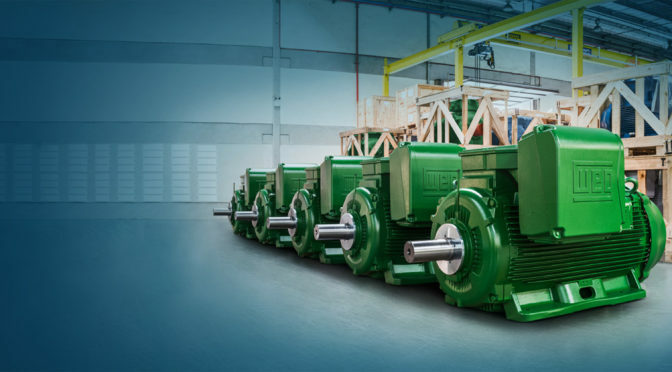 WEG’s design on the cooling system on these new motors was conceived using the most advanced simulation software and fluid flow analysis software, resulting in an innovative aerodynamic profile with reductions in both mechanical and acoustic noise. Because the terminal box is the point of contact between the user and the motor, WEG first carried out a field survey amongst installation and maintenance experts to determine optimal design performance. This research resulted in a new terminal box concept that prioritises the interface with the user, providing easier access and handling of the power and accessory cables and ensuring more reliability and versatility in the motor installation. The new terminal box allows improved cable housing, ensuring larger contact areas between the cables and the motor terminals and allowing correct tightening torque. The diagonal cut design of the terminal box base and the terminal box cover enables easier access to the electrical connection and gives a better view of the interior of the terminal box during installation procedures. Using the same WEG exclusive BMC (polyester with 20% fibreglass) die-cast terminal blocks that are used for the terminal blocks of hazardous area motors ensures high electrical insulation resistance and durability. In addition, the accessory cable connections are made with quick coupling connectors. “With a focus on designing for efficiency, coupled with the ability to understand and implement market needs, WEG W22 IE3 motors are a long-term solution to the ongoing need for energy usage reductions,” Steyn concludes. Three-dimensional printing – otherwise known as ‘additive manufacturing’ – gives minerals processing equipment solutions leader Multotec a new string to its bow, enabling rapid and effective technology innovation for optimal customer benefit. While computer-aided design (CAD) software has, for many years, allowed manufacturers to test new or improved products by simulating their behaviour on-screen, there comes a point at which it is quicker and easier to build a prototype of the product to elicit user feedback on the design and its functionality. Multotec invested in 3D printing technology to improve its efficiency in creating and testing these prototypes, thereby improving the speed to market of its newly developed products. There are already several examples of how successfully the group has done this, both here in South Africa and for its customers abroad. In one case, a Multotec Canada customer had a specific requirement for its unique spiral application and wanted the concentrate splitter to cut the flow in a specific location. To do this, a spiral flow diverter was designed that would attach to the spiral’s working surface in front of the product box. A prototype unit was 3D-printed in-house, and trial-tested and refined in South Africa. To minimise the lead time, a digital model of the prototype was sent to Multotec Canada, who was able to have the item 3D-printed in Canada within 48 hours – showing how rapid prototyping could create a customer-specific solution in just a short timeframe, almost anywhere in the world. Similar success was achieved in developing a quick-release spigot holder and coupling for a cyclone, following feedback received from customers. The customers had noted that the process of changing out the spigots was taking a considerable amount of time and effort, as all the bolts to the spigot holder had to be removed to replace the spigot. The solution pursued allowed the spigot holder to be screwed apart rather than unbolted; the prototype was 3D-printed in-house by Multotec and presented to the cyclones division – giving experts the ability to see and feel the product before any investment in tooling was made. The screw spigot holder and coupling are now being injection-moulded, which has further reduced the component’s mass, as well as the cost and time it takes to manufacture. In another example, a Multotec customer requested a solution to completely block material flow from the sliding splitters to the concentrate gully of their spirals. After a solution was designed, 3D-printed and successfully tested, a silicon rubber mould could be produced from the 3D-printed component. This mould was then used for casting polyurethane and producing a final product which met the customer’s needs, speeding up the time to market and cost of production. Multotec’s 3D printing capabilities have also allowed the company to study the concentrate flow in a spiral, by using a 3D-printed spiral off-take prototype that fits to the profile and slope of the spiral. 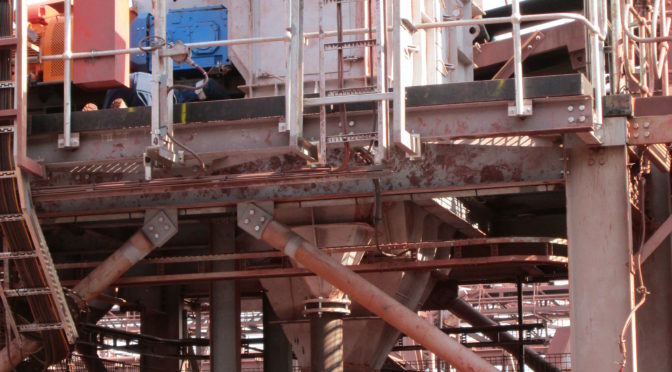 Research is underway to ascertain what the different grades are that exist within the concentrate section of the flow, so that equipment and processes can be continually optimised for customers – thereby enhancing plant efficiency and the overall cost per ton. Extending its total lifting solution for customers, Johnson Crane Hire now offers an extensive fleet of access platforms and telescopic handlers from its branch network around South Africa. 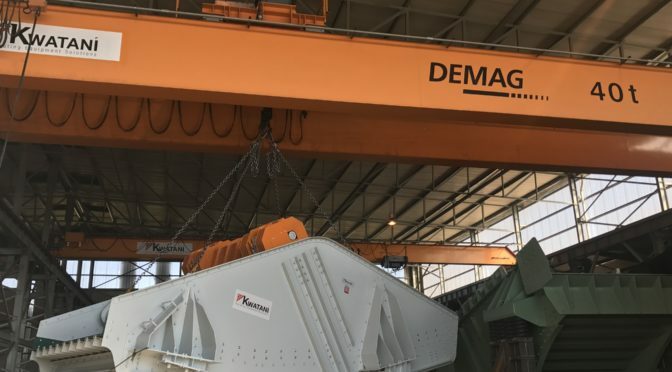 According to Steve Robson of Johnson Crane Hire’s business development executive, the new units were put in place last year after the company concluded its supply agreement with a leading international OEM. Johnson Crane Hire’s national footprint of 13 branches is therefore now equipped with its own access platforms and telehandlers, giving customers immediate access to them, and the branches continue to provide technical support as well. 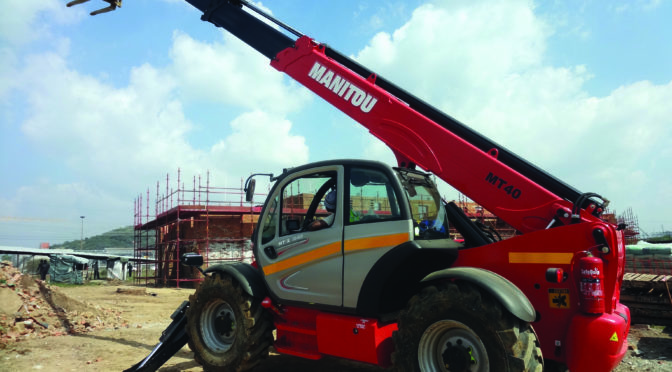 The new fleet includes platforms with a working height from 12 to 28 metres and telehandlers with capacities from 2 ton to 9 ton. Robson highlights that the new equipment has been very well received in a variety of sectors to date, from construction, mining and marine to petrochemical and power generation. With the company’s long history in serving the construction sector, this new range of equipment is allowing it to see more of the ‘inside’ of big commercial or retail developments, rather than just the big cranage work on the outside. “Shopfitters in shopping malls are part of this new customer base for us, as well as lighting and electrical installation contractors,” says Robson. “The added equipment range has also grown our opportunities in big warehouses, storage units and even in airports. The site of the Maluti Crescent Mall, being constructed by Concor Buildings, is at the foot of Parliament Hill in the historical local legislative district of the old Qwa Qwa homeland in the Eastern Free State. 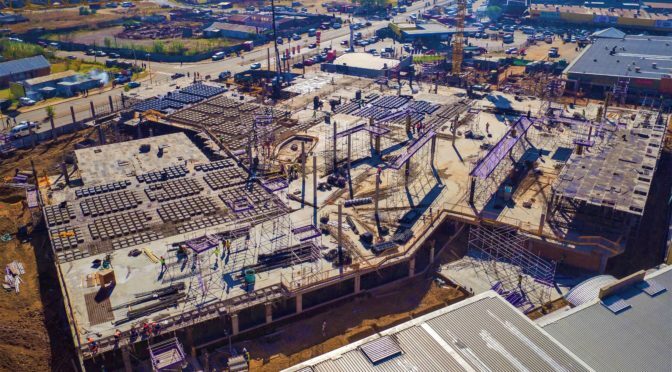 Designed by MDS Architecture and being developed by Flanagan and Gerard for Vukile Property Fund, when finished this impressive structure will incorporate references to local culture through fabrics and tiling patterns. Interior accents such as stylised mobiles which draw inspiration from mokorotlos, the traditional Basotho hat, will be included in the mall. Martin Muller, contracts manager at Concor Buildings, says this fast track project started in January 2018 and will be completed in March next year. The scope of work comprises the significant extension of the existing Setsing Crescent Mall in Phuthaditjaba. The new mall, which will have 12 600 m2 of GLA (Gross Lettable Area) plus additional under cover parking and a taxi rank added, will be named Maluti Crescent. It is being built over three levels including two parking levels with the retail level at the top. The new structure will be linked into the existing centre which will be operational throughout the contract period. Situated some 350 km from Johannesburg means that careful management of logistics is critical to ensure costs are controlled, and materials and resources are available on site when required by the construction programme. It is also significant to note that as part of Concor Buildings ongoing commitment to transformation the company is achieving a 70% local content objective. “With the assistance of the community liaison officer we have secured labour and materials from surrounding communities and are providing mentorship to ensure the future sustainability of the SMMEs in the area. In addition to this, skills development among our people remains a strong focus,” Martin says. The existing building steps down along the site which has a significant fall of around nine metres. At the junction of the new and existing building a new double volume court with a large picture frame window will be created. This will showcase the panoramic views of the magnificent Maluti mountains. 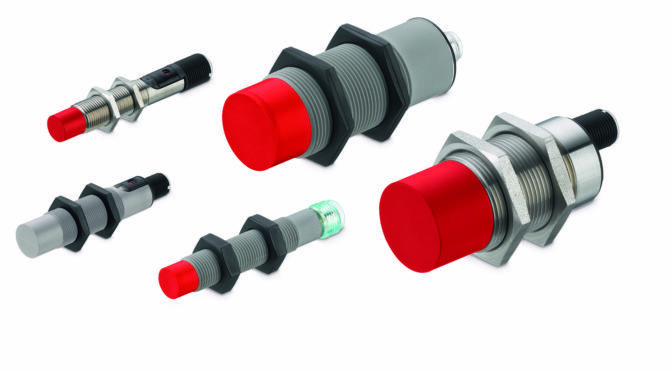 Countapulse Controls advises that German sensor specialist, Leuze electronic is expanding its portfolio of optoelectronic and inductive switches with capacitive proximity switches. This move will make it possible for users to procure obtain complete solutions for detection requirements from a single source. The company has been the official distributor for Leuze electronic for more than 45 years and offers a full technical advisory service. This, Gerry Bryant, managing director of Countapulse Controls, says enables the company to provide fit-for-purpose sensing solutions to industries across southern Africa. The introduction of contactless, wear-free switches which are resistant to electromagnetic influences, interference and contaminants in the air such as dust by Leuze will have major advantages for end users. The capacitive switches are available in a cylindrical or cubic design, as well as embedded or non-embedded versions for a wide range of mounting options. Due to their semiconductor technology, the Leuze sensors have a long life expectancy, regardless of the detection and switching frequency. The new variants facilitate contactless detection of numerous different objects and media, regardless of the shape. These sensors are particularly suitable for detecting objects in harsh and dirty environments due to the IP67 rated housing. These Leuze sensors can “see through” certain materials, which provides optimum accuracy in difficult sensing applications such as those found in food and beverage and printing and packaging operations. The devices can detect products in outer packaging and behind container walls as well as check fill levels and monitor these for completeness. Countapulse Controls offers a comprehensive range of sensing, measurement, counting, switching, monitoring and positioning instrumentation solutions. Customer support is through the company’s technical advisory service hotline which is available 24/7. There is a trend away from serrated grating because while it is suitable for some applications, there are others where over an extended period it will no longer provide the underfoot traction required to ensure safety. Floor grating is never a case of one size fits all, and according to Lance Quinlan, national technical sales consultant at Andrew Mentis, in certain applications the serrated feature on the grating surface becomes filled with grime. “This means that the serrated edge, chosen for this specific feature, no longer functions as a tractive surface and does not provide adequate grip,” he explains. Andrew Mentis has more than sixty years’ experience producing floor grating at its ISO accredited manufacturing facility and is known as the benchmark product across Africa. Quinlan says it is always important to not only consider the finish of the floor grating selected for an application, but also critical to look at how the grating is being manufactured. Mentis Flat Top floor grating is manufactured from slit coil material which provides the major advantage of having the flat top finish for which this product is named. This is unlike other manufacturers in the industry where the top of the flat bar has a rounded finish due to the manufacturing process at the mills. The disadvantage of the rounded top is that it will give little to no grip underfoot. In addition to its Mentis RS40 (40/40) floor grating which is considered the benchmark product across a range of industry sectors, Andrew Mentis, long ahead of the curve when it comes to providing solutions in floor grating, has also engineered a specific floor grating product that has a unique positive/raised non-slip characteristic on the flat bar section. By manufacturing the flat bar section with this unique raised dimple feature, Andrew Mentis has provided a grating which offers a far better tractive surface than just the plain Mentis flat bar grating and the Mentis serrated grating, while retaining the same strength as the flat top product. Mentis Rectagrid RS40 (40/40) Non-Slip grating is available ex stock in panel sizes of 2400 mm by 1200 mm. And importantly, for customers who have specific application requirements the floor grating can be tailored to meet the specific drawing requirements. It is also available in mild steel unpainted, bitumen painted and galvanised. This highly engineered floor grating product is produced at Andrew Mentis’ world class facility at Elandsfontein, Johannesburg. The company offers a full technical advisory service to assist to customers in the selection process, and Quinlan says this service has become increasingly popular with industry.